The Northeast region of India is one of the most beautiful travel destinations in the world. The land of Seven Sisters includes Tripura, Arunachal Pradesh, Assam, Mizoram, Manipur, Nagaland, Assam, and Sikkim in addition. Each of these states has a vast natural landscape, flora, fauna, and natural beauty to offer to travelers. All these states are small and pretty close together. But you need to take some Northeast tour packages to figure out how to cover most of the things to see in the northeast in the least amount of time. Each of these Northeast states has so much to offer that you cannot visit all in just a single visit. Assam and Arunachal Pradesh are not even that small. You cannot visit two of the other five states on one trip if you really want to explore the depths of nature in Northeast. So, you will have to choose where you want to go on this trip. You could go for the Orchid State of India, that is in Arunachal Pradesh, or you could go to Manipur for its culturally rich heritage. You can go to Assam if you want to enjoy the untarnished natural beauty. Or go to Tripura if you want to see endless bamboo and cane forest plantations, or to the land of the hill people, Mizoram. If you want to get to know over 14 different tribes of people, go to Nagaland. Visit the most beautiful place i.e. the Scotland of the East - Shillong in Meghalaya or you could go to Sikkim, the youngest of the sister states, the eighth state in the Northeast, and the most popular tourist destination for people from West Bengal. Guwahati is the gateway to many other places in the northeast. The ancient temples like the Kamakhya temple and Umananda in Peacock Island that dot the urban landscape, the wildlife sanctuaries at Kaziranga and Pobitora, the scenic beauty of Brahmaputra, black magic of Mayong and its culture make Assam one of the most visited tourist sites in northeastern India. Want to visit one of the most popular wildlife attractions with the most intriguing creatures like a one horned Rhino then Kaziranga National Park is the exact location. It is home to the world's largest population of one horned Indian rhinoceros. Apart from all human habitation, the natural life thrives so perfectly here. Along with the giant rhinos, Kaziranga National Park is also home to bears, panthers, elephants and other beautiful feathered creatures. It is very appropriate to justify his name on the list of UNESCO World Heritage Sites. Tezpur is another important tourist spot in Assam because of its scenic natural beauty. The Brahmaputra River that flows through the city from Sadiya, adds to the beauty of this place. Tezpur is also the cultural center of Assam due to its theater, traditional dances and cultural events. The tea plantations around the city are also another attraction here. Majuli, located about 20 km from Jorhat, is an ecological access point and the largest river island in the world. Jorhat Gymkhana Club is the first one built in Asia and is also the third oldest in the world. From here you can go to Dima Hasao hills. Digboi not only has a refinery, which is more than 100 years old, but also several tea gardens. The place with misty blue hills offers several attractions, including Digboi Oil Refinery, Ridge Point and Digboi Centenary Museum. From Ridge Point, you can have a breathtaking view of the snow-capped mountains of the eastern Himalayas. Meghalaya is famous for being the wettest place on the entire planet. Meghalaya also have quite a lot of natural and artificial lakes. 20 km before reaching Shillong is Umiam Lake. This lake is basically a reservoir upstream of the Umiam river. It is the perfect place to go for a picnic, boating or kayaking. There are many things to do in Shillong. The road from Shillong to Mawphlang also goes towards Shillong Peak and Elephant Falls. Only 15 km outside Shillong, the most famous waterfalls are the Elephant Falls. The water cascades down on three levels and you have to go down the stairs from the top to see each level. Other falls include Shadthum Falls, Weinia Falls, Bishop Falls, Langshiang Falls and Sweet Falls. 25 km from Shillong is this picturesque place called the Laitlum Canyon. The hike to the top of the hill is between moderate and difficult, but it is well worth the effort, as you will be rewarded with views of the valley below you. You can also go by bicycle or taxi to the top of the hill. There is a staircase of 3,000 steps leading to a village called Raslong. On your way, you will find bamboo plantations and colorful orchids. Perched on the eastern hills of Khasi, near the village of Mawphlang and surrounded by fields, is one of the most important tourist sites of Meghalaya, the Sacred Forest of Mawphlang. There are many sacred forests in these hills and the Jaintia hills of the state, but this is the best known. There are many medicinal plants, including those that can apparently cure cancer and tuberculosis, and Rudraksh trees. According to local tribal beliefs, a deity known as labasa inhabits the forest. The Khasi Hills Autonomous District Council has created a Khasi Heritage Village in front of the Mawphlang Sacred Forest. The culture and heritage of the tribe are also exhibited during the two days of the Monolith Festival held there. It may seem unremarkable, and even somewhat disappointing, for the uninitiated. However, a local Khasi guide will reveal its mystery. The David-Scott trail, one of the most popular trekking routes in Meghalaya, is located behind the forest. David Scott trail is a simple trek of 20 km, lasting 6 hours, which takes us through spectacular landscapes. This walk is simple but suggested for adults. This is because at some point you will have to cross a stream in water up to your waist. Hidden in a corner of Meghalaya between the crests of Sohra and Pynursla is the village of Kongthong, a remote village in India. Curious whistles and chirps echo in the jungle around Kongthong, but it's not a birdsong. They are people who call each other music, an extraordinary tradition that can even be unique. Kongthong is a village in India, where mothers compose a special melody for each child. According to the tradition of the community, everyone will address the person with this little individual melody for life. Cherrapunji (also Sohra) is the most wettest places on earth and is famous for its spectacular waterfalls, which fall on huge cliffs throughout the town like the Wei Sawdong Fall. The most impressive are Nohkalikai Falls, one of the highest waterfalls in India which emerge from a wooded ravine and fall 340 m along a rock face. During the monsoon, the flow of water that precipitates into the abyss is 20 times greater and the noise is deafening. The road is complicated, and many visitors prefer to see the waterfall from afar, from the viewpoint on the outskirts of Sohra. If the traveler wants to do so, Mawsynram, the wettest town on the planet. And the Jakrem hot springs near Mawsynram are greatly appreciated as they are believed to have healing and medicinal properties. When you are here, you can also visit the Mawjymbuin Caves, which is formed naturally. The best access points are the villages of Mawshamok and Tyrna, south of Sohra. Cherrapunjee is close to the most famous Double Decker Living Root Bridge. Perhaps the most famous Khasi tradition is the creation of living root bridges of Meghalaya, woven with the aerial roots of huge fig trees of the jungle. Several of these impressive natural wonders can be visited in the Nongriat village on a tricky tour of the centuries-old paths used by villagers selling areca nuts in Shillong. You need to go down a total of thousands of steps to see the two-story bridge. The hike will take approximately 5 hours to complete a trip. It is recommended to spend the night at the base of the mountain where there is accommodation. It can be physically exhausting to go down thousands of steps, but the landscape that can be seen is priceless. You will see lush greenery, flowing rivers, butterflies fluttering and much more. Also, climb for an hour to the Rainbow Falls, which are supposedly very picturesque and highly recommended by all hikers and locals alike. Also, bring swimwear if you want to take a dip in the creek. There are the Kynrem Waterfalls, the Seven Sisters Waterfalls, the Mawsmai Cave, the Daiñthlen Falls, the Arwah Cave, the Wei Sawdong Waterfall and much more. In the Khasi mountains there are more bridges of these, reminiscent of Lord of the rings, including the exquisite Mawlynnong, considered the cleanest village in Asia, from where you can reach Dawki, on the border with Bangladesh with the transparent Umngot River. The emerald green water of this river is so crystalline that you can see the river bed at 12 feet deep. You can take a boat ride, swim in the water, fish, eat freshly cooked fish or simply appreciate the beauty of this border town. Near the border of Bangladesh flows the Jadukata River, which has an abundant population of mahseers. If you like to fish, Ranikor is the best place to be. Fishermen can paddle down the river where the Kynshi and Rilang rivers converge to enjoy fishing. You can find gold mahseers, golden carp, silver carp and common carp. For caving in India, there are more than 150 krem (caves) that pierce the limestone bed of the Jaintia mountains, including Krem Liat Prah, the longest cave in India, which extends at least 25 km under the Shnongrim mountain range. Nagaland, which is limited by Assam in the east and south, Manipur in the north and Myanmar in the west is generosity of a nature in a narrow strip of mountainous territory. Kohima (capital of Nagaland) extended carefully by the face of the hillocks is a clear indication of the consolidation of homes with nature. The Catholic Cathedral on the Aradura Hill with its magnificent cross, Dimapur as the melting pot of the Northeast and the Nagaland State Museum promises a wide range of interesting and varied discovery. As there are number of tribes in Nagaland, each tribe celebrates its own distinctive seasonal festival. During the first week of December, Nagaland becomes the setting for the Hornbill Festival of deep-rooted tribal heritage. It is its capital, Kohima, where the event that gives rise to demonstrations of this culture is celebrated. Music, dances and dangerous indigenous games and sports are organised. The Kohima War Cemetery is a must see. It is a monument dedicated to the soldiers of the British unit as part of the allied forces during the World War II. It is at this point that the Allied Forces won a battle against the Japanese, forcing the latter to retreat. If you want to get into the details of the tribal culture of the Naga people, then the Naga Heritage Village is the place to be in Kohima. Pulie Badze is a popular weekend getaway for people who live in Kohima, perfect for a hiking trip up the hill to enjoy stunning views and a pleasant climate. Visitors walk to the top of the hill to get a panoramic view of the surrounding areas, including parts of Mount Japfu (Nagaland's second highest peak) and a panoramic view of the city of Kohima. Dzukou Valley is a charming valley that will offer you generous views of the emerald green hills, lush forests, winding streams and an explosion of colors with flowers blooming along the trekking trail. Manipur is one of the states of northeastern India and bordering Myanmar, formerly Burma. It is one of the least visited places in the country but it is not devoid of attractions. Take the opportunity to visit the beautiful Lake Loktak. Located near its capital, Imphal, it is a very pleasant place and the only floating National Park in the world. A canoe trip with one of the fishermen who live on its shores in order to navigate calmly among its islands of vegetation, called phumdis, is undoubtedly the best way to get to see the lake. Nearby is the Keibul Lamjao National Park where with a little luck, you can see some sangai, an endemic antelope that is in danger of extinction. Imphal has markets such as Paona Bazar and Khwairamband Bazar. Buyers can buy exotic shawl (Hauphee), Tangkhul scarf, various wooden items and the most popular Moirang Phee (a fine cloth) of art for their own. In Imphal, buying is quite easy as the markets are put together but people have to travel three hours to the Moreh market. What makes Moreh stand out is the picturesque trip and the cheap imported goods available. The fine movement of the Ras Lila (Manipuri dance), the extravagance of Thang-TA (martial arts) can make it an all-together different experience. The snowy Himalayas, the hills with green carpets, the pristine lakes, the numerous waterfalls, the river valleys and the monasteries that sing Buddhist hymns are what await you when you visit Sikkim. The scenic places to explore are distributed throughout the state. Here is a list of places to visit from the northernmost part of the state to the south. Gangtok is one of the most beautiful cities with varieties of rhododendron, orchids and butterflies. The first thing you will notice here are the buildings precariously perched on the edge of the hills. If you find a good hotel with a view, you can see the imposing Kanchenjunga peak in all its splendor. The top of this mountain has an orange glow, since the first rays of the sun adorn this mountain every morning. Wander around MG Road or the local mall. Explore the streets of Gangtok on foot or in buggy. Enjoy Tibetan, Sikkimese and Nepalese cuisine when you are here. Try the noodle soups such as Thupka and Thenthuk. Do not miss the hot steam momos that are easy to get here. Catch up on a book with fresh and hot tea at Cafe Fiction or look at the bustling streets of the comfortable Baker's Cafe. There are many monasteries around Gangtok such as the famous Rumtek Monastery, the Enchey Monastery, the Lingdum Monastery and the Gonjang Monastery. Rumtek Monastery is a gompa or complex built by the Karmapa of the Kagyu Buddhist order. Belonging to the Nyingma Buddhist order, the Enchey Monastery (Solitary Monastery), was initially built in the 19th century and rebuilt in Chinese architectural style in 1909. These Buddhist temples are colorful, you can listen to the monks singing prayers and you can see how the life of these monks goes as they live, study and continue to work in this monastery. In the gardens of the palace of the ancient kings, the Chogyals of Sikkim, we find the Tsuklakhang Monastery or Royal Chapel. Closer to Gangtok is the Deorali orchid sanctuary in southern Gangtok and Fambong Lho Wildlife Sanctuary, approximately one hour west of Gangtok. The Kyongnosla alpine sanctuary is located one hour east of Gangtok, on the way to Lake Tsomgo and Nathu La. Stroll on the cable car to enjoy magnificent views of Gangtok at the top of the hill. Rafting on the river is the ultimate adventure activity to get to Sikkim, and the Teesta River offers some world-class opportunities. The main route is Makha-Sirwani-Bardang-Rongpo. The Rangeet River, with its more turbulent waters, also offers advanced opportunities for rafting from Sikip-Jorethang-Majitar-Melli. Practice paragliding in the village of Baliman Dara or Reshithang or mountain biking in the rugged region surrounding Gangtok. The Do Drul Chorten is one of the most important of Sikkim and inside it houses numerous relics of sacred Buddhist books and religious objects. At the top of a hill and after circumventing numerous steps, stands the small Ganesh Tok temple. The temple itself is quite small, but it's worth going up here to admire the views over Gangtok and the Kanchenjunga peak. Chungthang Valley is between Lachung and the Yumthang Valley, famous for Yumesamdong (Zero Point)and Mathilda pass. This point is 15,300 feet in altitude and the stretch of road that brings you here stops abruptly. That's why this place is called Zero Point. Here you will find some members of the army, since the Chinese border is a few kilometers from here. Chungthang is 96 kilometers from Gangtok. Lachen is 35 kilometers from Chungthang with snow-capped peaks. Shingba Rhododendron Sanctuary, located in the Singalila range in the southwest corner of West Sikkim, Gurudongmar Lake, Chopta Valley, Thangu are the biggest attractions. It is a valley surrounded by giant snow peak mountains and is the starting point of the Green Lake Trek. In fact the village is cradled between stern, high standing rocks as protectors. This village is almost hidden from the outside world like a Shangri-La. Visit the Lepcha village. At an altitude of 17,800 feet, this is a must see in Sikkim. It is located in the northernmost point of Sikkim and is very close to the Chinese border. Nestled between the mountains, this lake is as isolated and pristine as it can be. The crystal blue waters surrounded by sterile earth reflect the snowy mountains. You can see colorful prayer flags hanging from the rocks. This is a place where you can pause and appreciate nature in all its splendor. The region through which Lachen Chu flows is completely covered with rhododendron forests with Chopta and Thangu valley as other places of interest. Yumthang is located at an altitude of almost 11,800 feet. On the way back you can visit the famous hot spring which is known for its healing properties. Yumthang is a valley near the Lachung Chu River surrounded by mountains where the tree line ends. In spring the valley erupts in riot of colors with flowers like Primulae, Rhododendrons and many other flowers in full bloom along with snow covered valley. Yumthang has snow all around and the snow clad mountains add to the beauty. Wander up to Lachung monastery and the of Lepcha village. Yumesamdong is a large valley surrounded by mountains and Katao is a snow-covered peak near Lachung. Now, it is the base camp for the famous Rhododendron Valley Trek from the Yumthang Valley to the Lachen Valley. If the weather is good and the sky is clear you can get to see the Himalayan range. The location on the road offers a majestic view of Mount Pandim, Mount Kabru, Mount Simvo, Mount Jopuno, Mount Khanchendzonga, Mount Sinolchu and other peaks and the wooded path of the Rhododendron forest usually blooms during the spring. This valley has stunning views of the Himalayas, small villages, bright streams and fruit orchards. If you come here in June, you will be lucky enough to witness the Saga Dawa Festival, the most sacred festival for Buddhists. During spring, this place is full of Primulae, Rhododendrons and many other alpine flowers in full bloom. During the winter, this place looks darker and more rugged. This is one of the high-altitude lakes of Sikkim, fed by the nearby Zemu glacier. This glacier is 26 km long and is located at the base of the Kanchenjunga. There are many adventure walks in which you can board around this glacier. This is the best way to fully enjoy the terrain in the Himalayan laps. This UNESCO World Heritage site is a unique diversity of plains, valleys, lakes, glaciers and spectacular snow-capped mountains covered with ancient forests. This great site has the third highest peak in the world, Mount Khangchendzonga. The best way to experience the spectacular views of this mountain is by taking a walk through the port of Goecha La. This would be a moderate to difficult hike with rewarding views of many peaks in the Himalayas such as Mount Pandim. This is not the typical mountain town. The reason is that Dzongu is located in the buffer zone of the Kanchendzonga National Park and is home to the Lepcha tribe. In about 3 hours from Gangtok, Dzongu is an experience that you will value all your life. This city is the base if you want to make a small trek to Maenam Hill and Borong. In the south of Sikkim we find the Ravangla Buddha Park (about 80 km from Gangtok), also called Tathagata Tsal. Built in 2006, on the 2550th anniversary of the birth of Gautama Buddha, the government and the inhabitants of Ravangla decided to create a complex with a giant statue of Sakyamuni Buddha and a beautiful garden surrounding it. How could it be otherwise, is part of the important circuit of Buddhist pilgrimage. The Palchen Choeling monastic institute (also known as the new Ralong monastery) in the nearby town of Ralong also houses a golden Buddha of considerable size. You'll find Maenam Wildlife Sanctuary near Ravangla in the south of Sikkim. Halfway between Ravangla and Namchi, you will find the picturesque Temi Tea Garden. It's just a tea garden in Sikkim and the peaceful Cherry Resort is in the middle of it. You can also go to see Cho Zo Lake and the Rabong Monastery. Yuksom has become the base camp to ascend Mount Kanchenjunga. The Dubdi Monastery, one of the oldest in Sikkim, is a Buddhist shrine also called Yuksom Monastery which is accessed after walking for an hour from Yuksom. At the top of the roof, there is an ornate bell-shaped golden dome called Gyaltshen. Along with the Dubdi and Ngadak Chorling monasteries, the Kathok or Kartok monastery, named after one of the three monks who crowned the first king of Sikkim, is one of the most important of Yuksom. It is next to Lake Kathok and the Norbugang Forest and, after climbing a small wooden staircase, you access the building that is very striking for the amount of colors, including red as a base and yellow ornamentation, a classic Tibetan style. Tashi Tenka was a complex built for the delight of the royal family when Yuksom was the capital of the Namgyal kingdom. One of the most recommended is the Goechala and Dzongi trek, which will take you to walk among the most impressive mountains in the area, seeing the Kanchenjunga peak of more than 8500 m, the Talung or the Rathong. One of the places not to be missed in the center of Yuksom is the Mani Hall temple, with large glass windows that reveal huge golden copper cylinders. The trip from Yuksom to Dzongri Peak and Rathong Glacier, and beyond to the Goecha Peak if you are prepared for the challenge, is the most popular trek in Sikkim. Pelling is located at an altitude of 2070 meters. On a clear day guest can get a nice view of the Himalayan snow capped range Pandim, Khangchendzonga, Kumbhakarna, Rathong, Narsing, Zopuno, Shimbho, Sinolchu. It is one of the exotic destinations with historical sites, short trekking routes and wildlife. Its botanical and zoological wealth is inspiring and the panoramic view is something to be seen to be believed. Kaluk, Rinchenpong and Namchi are some of the tourists place nearby. In Kaluk there are some night resorts and from there you can walk the distance (3 km) to Rinchenpong to see the monastery and get trapped by the tranquility of this area. Other places of visit are Rimbi waterfalls, Rimbi Rock Garden. Lake Kechopalri, is one of the Buddhist holy lakes. Myth is that when a leaf falls on the water surface, it is picked up by a bird and thus the surface of the water is always leafless. Near Khecheopalri monastery is the Kanchenjunga Falls, ruins of Pemayangtse monastery, and Rabdentse monastery or the Sanga Choeling and the Rathong valley with all its mountains in the background. The panoramic view from the top of the ruin to the mystical heights of Kanchendzonga ranges is something to be caressed. Wander around the helipad or shopping center. Tashiding monastery is famous for the Bhumchu festival. There is a large statue of the local deity called Guru Padmasambhava on the top of Samdruptse hill in the beautiful Namchi valley. You can also visit the Samdruptse Monastery a short distance from the sanctuary. Another thing you can do in Namchi is to see Siddheshvara Dham, a complex with different replicas of the most important temples of India, and a statue of Shiva. If you happen to travel between February-March or October, you will catch the Namchi flower festival. Changu lake is only 40 km from Gangtok. It stays frozen throughout the winter. During the rest of the year, the lake's water reflects different colors. This lake is considered very auspicious by the locals. See if you can do a yak safari for this place. It's as exciting as a camel ride through the sand dunes of a desert. Stay at Gnathang or Dzuluk or Kupup. The road continues climbing up to reach 4300 meters of Nathula Pass and then descends towards the Nathang Valley and then the famous Zuluk Zig Zag Road to end at Lingtam. It is the Old Silk Route that is unanimously defined as one of the most beautiful routes in the world. Nathu La pass in eastern Sikkim was an important passage on the ancient Silk Road between India and Tibet. Indians require an inner line permit to visit it. Unfortunately, travel here are allowed only on Wednesdays, Thursdays, Saturdays and Sundays. A special permit is also required and can be obtained through a travel agency registered in Gangtok. On the way, you will meet Dzuluk, which is a village at a height of 10,000 feet. Dzuluk is an unusual but close destination near Padamchen. You can see winding roads below the village on the edge of the mountains that lead to Nathula. Northeast of Zuluk is Lungthung and is southwest of Lungthu. Zuluk is located about 3,000 meters above sea level on a slope surrounded by steep mountains. To have an unobstructed view of the Kangchenjunga massif it is necessary to climb a few more kilometers, but accommodation can no longer be found. The village of Zuluk is aptly called the abode of the clouds. The garrison located in the surroundings is also called that of the fighters of the clouds. Before independence, the English soldiers who were there for the construction of the roads were physically strong and survived on the basis of a diet consisting of whole chickens and a bottle of Ron. There are no hotels or hostels in Zuluk, and the town has not changed since the time caravans and their yak convoys had a habit of stopping for the night, making sure to get there before the sun sets. Comfort is rudimentary, with ingenious heating systems in the rooms. The village is composed of few families, and most of the men work for the army, installed in the transit camp located about 300 meters above Zuluk. Huddled in the jeep, we left Zuluk in the cool, foggy darkness of 5 am the next day. The driver, installed at the wheel as usual, step on the pedals and take the vehicle through tortuous slopes to a strategic place to enjoy the sunrise. Zuluk is covered with a thick layer of snow since a few days ago and the higher we climb, the more it thickens at the edge of the road. Totally green and yellow during the monsoon, the region offers browns and reds during the winter. When turning by an abrupt curve, we observe the sky that is going from a deep violet color to pink tints. About fifteen minutes later, while the temperatures remain glacial outside and that Zuluk is no more than a miniature version of herself, the sun, with its orange face, appears at last among the peaks of Bhutan. An amazing vision with a panoramic effect at 360 degrees, the road has been ornate, for a moment with a golden and silky glow. Right in front of the sun, the Kangchenjunga massif drastically changes color from one minute to the next. How many spectacular sunrises in altitude exist in the world? The glacial silence was broken by our driver, who invited the team to have a hot coffee. Just what we needed! We continue our ascent along the winding road. After the viewpoint of Thambi and the town of Lungthang, we spotted a couple of Lophophore, a local bird species close to the peacock. We progressed with difficulty in the direction of Nathang Valley where, according to legend, a woman claimed to have seen a yeti some years ago. But our biggest surprise was discovering bear tracks along the way. We were the first to pass after the snowfall and the road was marked by these tracks for several kilometers. The bears must have traveled the road at night. Kupup is located about 35 kilometers from Zuluk, at more than 4,000 meters of altitude. Seen from above, the lake is shaped like an elephant. That's why it was named after the Elephant Lake. Bhutan uses its waters for a long time. The lake is also the usual place where Chinese red-billed cranes come to nest. A little further we see the Jelep La Pass. We cannot ignore the Chinese and Indian bunkers on both sides of the pass. The climb is steep, but at the top the view is sublime. Kupup and its environs, the winding roads that lead to Jelep La and Lake Elephant, were a grandiose panorama that also had to marvel the merchants of the ancient Silk Road. Just a little further away is another of these curiosities created by man, the highest golf course in the world, installed and maintained by the Kupup garrison. For all those who wish to experience the Eastern Himalayas in all its purity, without any kind of material comfort, this route is absolutely recommended. The places are little contaminated by the commercial tourism, they are still authentic and surely this way they stay during long time. It is not possible to reach Gangtok, the capital of Sikkim directly by plane. Until recently the nearest airport was Bagdogra Airport in West Bengal. This airport is 126 km away and it takes 4 hours to get to Gangtok by bus or jeep. There are direct flights from New Delhi, Mumbai, Calcutta and other major cities to Bagdogra Airport. Located at an altitude of 1,700 meters, now the newly opened Pakyong airport near Gangtok is the ideal way to get there. To enter Sikkim, foreigners need a special permit. This permit is called Restricted Area Permit (RAP) and is free. The initial permit lasts a maximum of 30 days, and may be extended for a further 30 days up to 60 days. If once inside you want to stay longer, to extend the permit you have to go to the foreign registration office in Gantok and in some cities in the offices of the superintendent of police. This permit gives you the right to move practically all over the East, West and South Sikkim, and a small part to the north, to the village of Singhik. You will need photos and a photocopy of your passport. You have many options to process permits, from Delhi, Calcutta, Darjeeling, or at the same border post of Sikkim in Melli. Before you could enter through Jorethang but, currently you can only enter through Melli. Practically in all the cities or villages there are hotels, guesthouses and homestays. From Siliguri there are direct jeeps to Gantok, so if you do not intend to stop by Darjeeling, this is your best option. Siliguri has a train station, but if you come from Delhi, Calcutta or large cities, you will stop at the NJP station, a little further away. 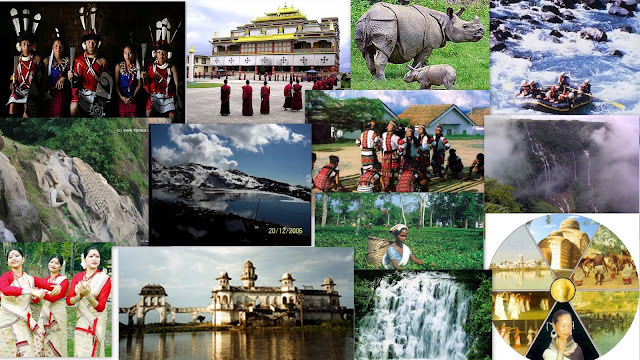 Each of the states in Northeast India is worth visiting. So get hold of a Northeast tour packages catalog and plan your next trip soon. You can take at least two trips in a single year if you plan your budget well.